Some time ago I wrote an article on why we may chose to play in different positions. Second position is the what most blues players chose for their day to day needs. With this article I would like to challenge you to start exploring positions a bit more. Since it is close to Christmas when I write this, I will use Jingle Bells as my example. If you find tabs for melodies it is most likely written in first position. 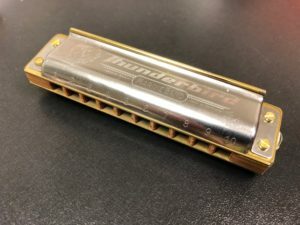 These are often quite simple to play on a diatonic harmonica. However, the possibilities for using the strength of the harmonica for expressions and sounds might be limited. I the picture below you see tabs for “Jingle Bells” in first position. Try it out, it is not too difficult. Jingle Bells in first position. While you play it, think about how it sounds. Do you want to add something? Does it sound interesting enough? Asking yourself these questions i key when exploring positions. By simply trying out the melody in second position instead you will get a different feel for the melody. Going from a major melody in first position to second position is often quite OK. Most notes will not be too difficult to play. Below you find the tabs for “Jingle Bells” in second position. Try it out to compare to first position. Jingel Bells in second position. Which one do you prefer? Do you get more chances to express yourself? Whas it harder or easier? The next time you are playing a melody, don’t just play it everyone else plays it. Take some time exploring positions that might give you a better sound.